Kanye West's recent MTV Video Music Awards invasion created a media frenzy and went viral with a Kanye West T-Shirtnumber of related videos beginning with the opening the rap star used when going onstage to interrupt Taylor Swift's award acceptance speech, "I'ma let you finish..." It's a statement that has become forever imbedded in pop culture jargon and it's also inspired fashion. Yes, the latest viral trend has not only extended to mocking YouTube videos and other hilarious outbursts in social media, and even from President Obama himself, it's even extended to fashion. 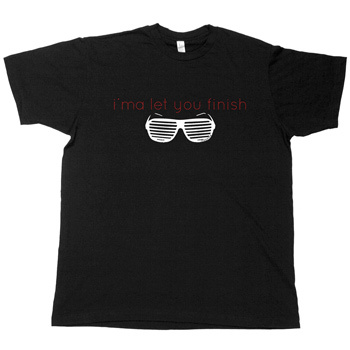 Just Jared, has released a new t-shirt with the catch phrase "I'ma let you finish" with an emblem of sunglasses that have become a characteristic accessory of Kanye West. The fact that Just Jared has created a t-shirt, just goes to show what viral monster the memorable VMA situation created; since other than clothing items with their own branded logo, the only other fashion design they've created is a t-shirt that says "I'm dating Jon" (a knock at the media frenzy about the Gosselin dad). It's a simple t-shirt that memorializes this awful moment in pop culture, but would you wear it or is this a phenomenon on its way out? Read more about the viral videos and media frenzy that have surrounded this situation here to get a grasp about what inspired this unique novelty t-shirt.